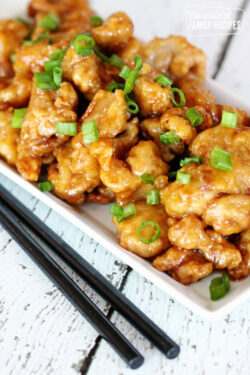 This Orange Chicken recipe tastes just like the popular Panda Express dish, but made with simple ingredients right at home! Tender chicken in tangy sauce beats restaurant take-out any day! Combine cornstarch salt, and pepper. Dip chicken in beaten eggs and shake in cornstarch mixture to coat. Combine 3 tablespoons of cornstarch with 1/4 cup of water and mix thoroughly. Slowly stir cornstarch mixture into sauce until it thickens.